Logik are a Carbon Neutral Company and proud of it! Thinking differently and using the very latest smart technology can reduce your carbon emissions and really make a difference. In 2004 we wanted to make a difference so we started by looking at the technology available and how it would impact on how we were sharing, photocopying and printing our information so that we could become more efficient and reduce our carbon footprint. We are now a certified Carbon Neutral Company and proud of it. Multifunctional photocopiers (MFPs) and network printing equipment using the very latest LED technology together with print management software such as PaperCut MF and Toshiba Fleet Manager can reduce waste, reduce costs, improve productivity and help your company become greener. Let us show you how! Logik have now offset over 90 tons of carbon emissions and invest in the African Carbon Management Project producing energy efficient stoves which prevents the release of carbon dioxide when cooking with fuel intensive open fires. 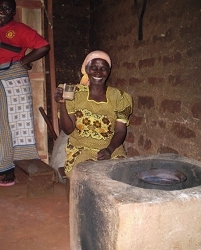 These stoves reduce the amount of firewood needed for cooking by 70% this in turn prevents the release of carbon emissions through the reduction in burning firewood.